Margaret Bourke-White (1904–1971) was one of the leading photojournalists of her time, a mainstay of the Luce empire whose signature work for Fortune celebrated the machine age and whose later work for Life featured the human face and a “progressive” humanitarian sensibility. Many of her photo essays are classics; indeed those on the Louisville Flood and its victims, on the liberation of the Nazi death camps, and on the poverty of India and Pakistan are now part of the iconography of the twentieth century. In this brief collection of her earliest work, two art historians present the “unknown” Bourke-White, the young amateur aged eighteen to twenty-six. Her first photographs, created in 1921 under the tutelage of Columbia University’s Clarence H. White, were impeccably designed soft-edged still lifes, “painterly” images characteristic of the period but not of the artist. Bourke-White took this technique to college – to the University of Michigan and to Cornell – and there made traditional portraits of campus buildings and, almost by accident, her first “industrial” photograph, a Duchamp-like study of loudspeakers. 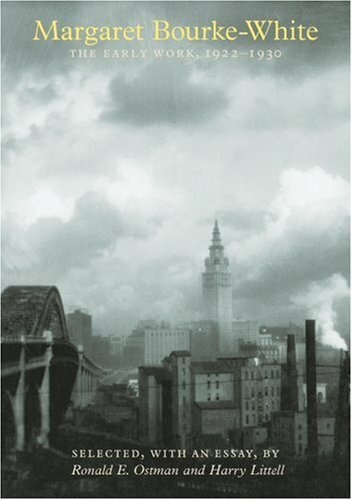 After graduation she moved to Cleveland, where, trembling with fear and aesthetic excitement, she photographed the interior of the Otis Steel Mill, the trestles of the High Level Bridge, and the new Terminal Tower. It was these thrilling Cleveland photographs, made in 1928–30, that won her an audience with Luce, who sent her on to Fortune ... and to fame. The eighty photographs reproduced here have seldom been seen outside the archives of Cornell’s Herbert F. Johnson Museum of Art and the University of Syracuse Library. They will fascinate anyone interested in the life and work of Margaret Bourke-White and the early history of American photojournalism. Ronald E. Ostman is a professor in the Department of Communications at Cornell University. Harry Littell is a photographer, an artist, and a teacher at Tompkins Cortland Community College, in Dryden, New York.